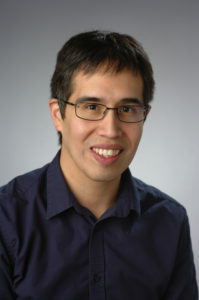 Carlos is an assistant professor in the departments of Biology and Chemistry at Syracuse University. So how did he get here? As an undergraduate, he studied chemistry and mathematics at La Salle University in Philadelphia, PA. He then worked as a research technician at the Wistar Institute in Harold Riethman’s lab, before moving to Baltimore to attain his PhD in molecular biophysics at Johns Hopkins University (he highly recommends this graduate program). He worked with Bertrand García-Moreno and graduated in late 2008. After a 6-month stay as a postdoc at JHU, he moved down I-95 and completed his postdoctoral training at University of Maryland, College Park with David Fushman, before moving to Syracuse in August 2014. One of the things that kept him sane through graduate and postdoc life was running as well as swing dancing. He ran Chicago, Philadelphia and DC half-marathons, as well as the Philly Marathon in 2011. While he used to spend his free time either playing DDR or changing diapers, he now is trying teach Luke how to run and Ava how to walk.